Prepare to fall in love with this turn of the century farmette! 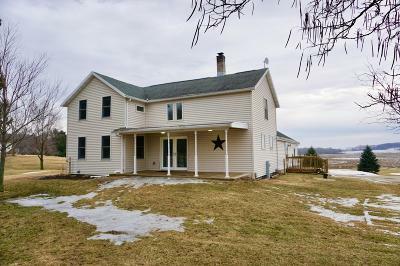 Located just east of Fort Atkinson this 2.73 acre property boasts a warm farm house straight out of CountryLiving Magazine. Step inside and the two-story dining, open concept kitchen, exposed beams and brick, and soaring loft welcome you. Enjoy cozy winters by the pellet stove in the family room with vaulted ceilings and windows galore. Don't miss the spacious main floor master suite with mansion sized walk in closet and ensuite bath. Be sure to check out the barn complete with horse stalls, ample shop space, piped compressed air, and running water. Reap the rewards of the labors of the previous owners- new Pella windows, siding, and insulation '05, pellet stove '10, electrical '08... the list goes on. See it today!